“Hasn’t most of the migration stopped? It doesn’t look like there is much water use at your stations. Why do you still need volunteers?”Questions like these are being asked by some individuals and they are fair and understandable questions. Whatever side of the political spectrum people you are on, you are hearing that desert crossings are at their lowest level in seventeen years. The reasons for this can be debated, but all indications are that the number of people currently crossing between the border points of entry has diminished significantly. 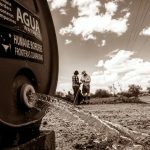 Along with this fact, you read in our weekly report, posted on our website (www.humaneborders.org) that on many runs, our volunteers are not adding water to water stations, or they are only adding five or ten gallons. The short answer to the question of whether we still need volunteers is YES, we very, very much need volunteers, especially drivers. Why? Because even though the numbers of people crossing is down substantially, the rate of migrant deaths is not declining; in fact, it has been rising steadily for some time. An important caveat here is that no one can with real confidence verify numbers of people crossing the border between entry points nor the number of migrant deaths in any given period. Rather, U.S. Customs and Border Patrol estimates the number of people trying to come into the U.S. between the ports of entry by using the number of apprehensions. Humane Borders uses the number of human remains found and identified as a surrogate for estimating the number of deaths. There are obvious problems with both assumptions. In terms of the number of deaths, for example, we know with sad confidence if a glass bubble were to descend over the United States tomorrow, we (in the larger sense of anyone walking in the borderlands) would be finding human remains for many years to come. During the first decade of our operations, volunteers on a water run often saw large groups of people travelling from the border. We began noting a significant decline in the number of people we were seeing along roads and highways several years ago. Today, if a driver does see someone, it’s usually an individual or small group of individuals in distress. 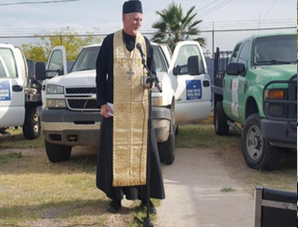 In 2013, Dr. John Chamblee, Humane Borders Research Chair, noted that despite the dramatic decline even then in the number of apprehensions in the Tucson sector – from 616, 346 in 2000 to 120,000 in 2012 – the number of deaths appeared to be increasing. 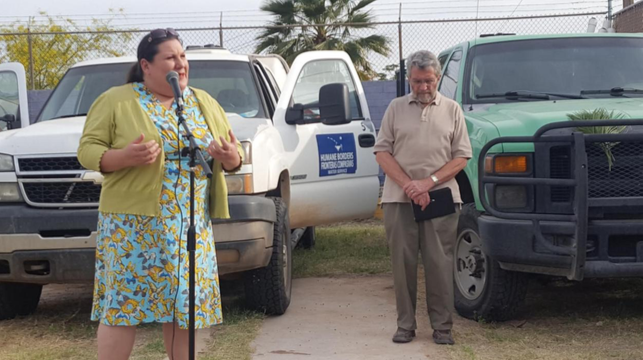 Dr. Chamblee noted that the data we use in partnership with the Pima County Medical Examiner’s office indicated that migrants were dying closer to the border and further from the roads that would make it easier for people to be rescued. In 2015, we noted an alarming rise in the percentage of human remains discovered in the west desert area, jumping from 10% of the total human remains identified in the Cabeza Prieta corridor in 2013 to 24% in 2015. We responded aggressively to this shift in migration, adding seven stations in the west desert area. 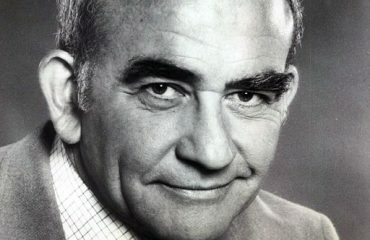 The trends noted above have now accelerated. The number of apprehensions reported in the Tucson sector (which covers most of southern Arizona) for all of 2016 was 64, 891 (again, compared to 616, 346 in 2000). However, the number of human remains being found is on the rise with 46 sets of remains already identified this year (see humaneborders.info). It is the case that some of these remains are older and are being found now because no one was in the area earlier. However, deaths are still occurring now. 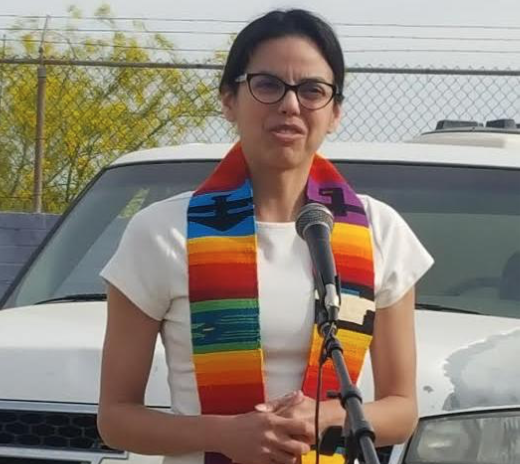 Indeed, just last night at our regular volunteer meeting, our Executive Director, Juanita Molina, reported that a group of three persons crossing in southern Arizona who had been discovered yesterday, sadly too late for one young man who died in the desert. The other two people were flown to a hospital. The individuals or small groups visiting our water stations today often can only drink and carry a small amount of water. What our drivers record on the weekly reports is the amount of water added, not the amount of water that has been consumed. But a few quarts of water dunk by one individual is likely critical to saving that person’s life. And, indeed, over the past few weeks, we have seen a rise in water usage in the Sasabe corridor southwest of Tucson and for the past several months, we’ve seen an increase in use in the west desert stations. This is a long way of explaining why it is still vital that we are out there delivering water. And we especially need drivers and passengers during the summer when we have approximately 28 runs a month (as opposed to about 18 runs a month in the winter). 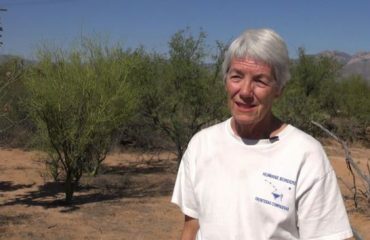 We have less volunteers in the summer due to vacations and indeed, people leaving Tucson for the entire summer. We will particularly need volunteers this year from mid-July until early September. Our trucks are Chevrolet C-350s and one equivalent Ford, with 300-gallon water tanks on the back, a load of more than 2,000 pounds. 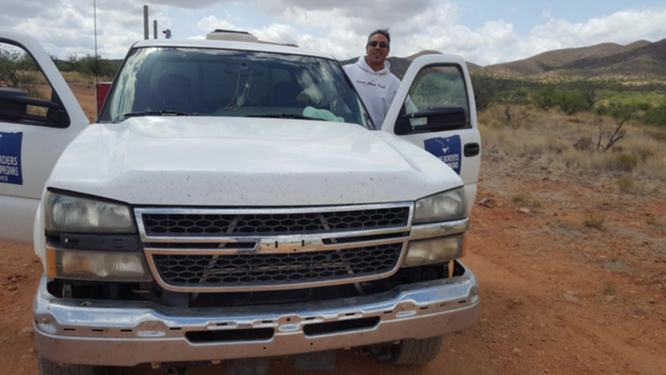 The trucks have four-wheel drive, power steering, and air conditioning, and they are remarkably easy to use, especially driven slowly on the bumpy, rutted, remote dirt roads on which our water stations are located. Volunteer drivers should have licensees clean of insurance surcharges (i.e., no recent violations) and the ability to learn and remember the twists and turns of the roads leading to the water station. If you are interested in volunteering and you are in the Tucson area, please come to one of our weekly volunteer meetings, every Wednesday (except Thanksgiving and Christmas weeks) at 5:30 pm at our offices at 243 W. 33rd St., at the corner of 33rd St. and 9th Avenue. We are located within the House of Neighborly Services complex, managed by the YWCA. There is a large blue and white Humane Borders banner on the wall next to the front door. There you can meet some of us, see where the trucks and sign up for a water run. Or if you can’t make a meeting or are out of town but coming to Tucson, please send us an email at info@humaneborders.org . WE STILL NEED YOU!!! And last, but most importantly, thanks to all of you reading this who are volunteering in whatever season you are available. 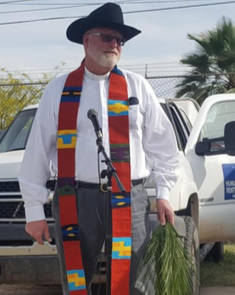 On April 9, 2017, we held the annual Blessing of the Trucks at our lot on 9th Avenue and 33rd Street in Tucson. Humane Borders board member John Hoelter, a third-generation Lutheran minister, organized and led the event. Blessings were offered (focused more on the migrants and the volunteers than the inanimate vehicles!) by Episcopalian Minister Rev. John Leech, Franciscan Monk Br. David Buer, One Spirit Interfaith Minister and flutist Twinfeathers, Eastern Orthodox Minister Very Rev. Dr. John H. Erickson, President of the Congregation Bet Shalom Anne Lowe, Pastor Ailsa Guardiola Gonzales of the First Christian Church, Rev. 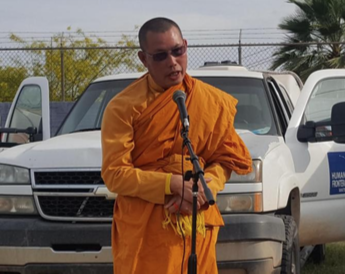 Steve Keplinger of Grace St. Paul’s Episcopal Church, and Abbot Ajahn Sarayut Arnata, of the Wat Buddhametta Tucson Buddhist Meditation Center. The remarks of the blessing-givers stressed several overlapping themes: the life- giving nature of water and its actual and symbolic importance to people and to the earth; the wish that those who deliver water do so safely and successfully; the need for universal love and compassion; and the fervent hope that migrants crossing the desert on foot will find our water, and survive their journeys unscathed. 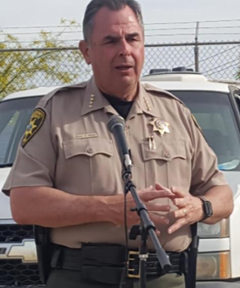 We were honored by the presence and the message of Pima County Sheriff Mark Napier, who praised the work of Humane Borders and stated that in his opinion the treatment of migrants is above all a human rights issue that must be addressed in a kind and measured fashion. Two east coast museums have mounted exhibits recently that included the work of Humane Borders, our water barrels, and migrant artifacts. 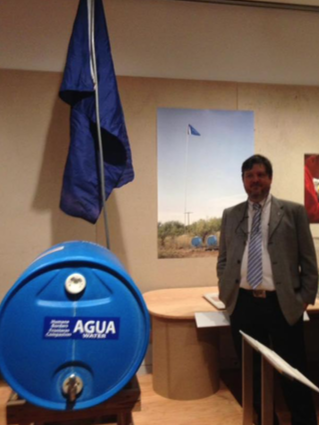 In New York City, the Cooper-Hewitt Smithsonian Design Museum displayed a Humane Borders water station, flag and warning poster, along with photos of our work in a show entitled By the People: Designing for a Better America. The exhibit ran from late September 2016 through late February 2017. Humane Borders Board Member Dr. John Chamblee of the University of Georgia, the genius behind our death mapping project (see photo), and Juanita Molina, our Executive Director, attended the opening. This year, the Old Library Atrium Museum in West Chester, Pennsylvania has been displaying migrant artifacts collected by Humane Borders volunteers from Ajo, Phoenix and Tucson. They are part of an exhibit entitled, The Struggle for Human Rights in Latin America, 1967 – 2017which focuses on border migration, indigenous land and water rights, cultural heritage, narco-trafficking, political movements, the “Disappeared”, and transitional democracy. 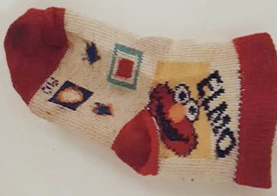 Our favorite migrant artifact is an Elmo baby sock found at an abandoned migrant encampment near one of our water stations in Arivaca, Arizona. 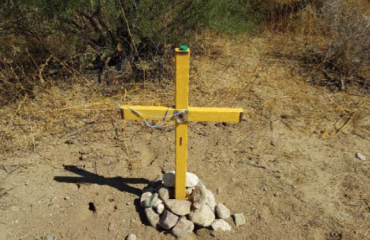 Here is a link to an extremely moving Cantu piece, titled Clearly Marked Ghosts,on his discovery in the Arizona desert of the body of a recently deceased migrant. The essay, published in the online magazine “Territory,” features our death mapping work. It forms a part of a book by Mr. Cantu that will be published soon. Brad Jones is a professor of political science at the University of California at Davis. Below is a link to a scholarly article, of which he is the lead author, which documents a surprisingly low level of awareness of the issue of migrant deaths among college students in the United States, a group one would hope to be better-informed. Both Mr. Cantu and Prof. Jones are current Humane Borders volunteer passengers. 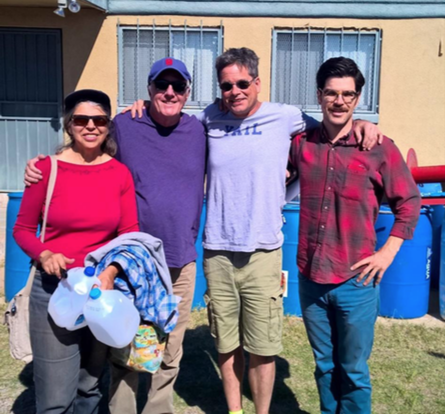 This is our Fab Four after returning from our Arivaca water run in April 2017. From left to right are Dinah Bear, Humane Borders Board Chair, Stephen Saltonstall, volunteer driver and Board member, Brad Jones, and Francisco Cantu.